Dallying by insurers representing state public bus company Sistecozome has meant that a U.S. couple in their 80s who were run over by a bus on a Puerto Vallarta street March 19 have had to pay their own hospitalization costs and hire a private jet to take them back to Phoenix, Arizona. 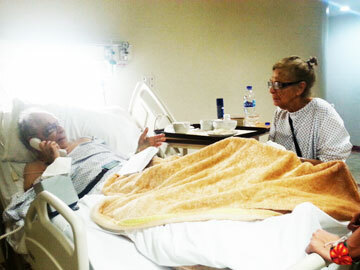 After spending more than a week at Vallarta’s CMQ Premier Hospital, Rhoda and Paul Fuchs decided to pay the mounting medical bills of around 50,000 dollars and return home. They also forked out 22,000 dollars for the air evacuation. Paul Fuchs needs further surgery on his legs and considerable rehabilitation before he will be able to walk again, if ever. His wife got away with lesser injuries and is recovering well.